I’m sure all of you would want an extra $7,500 but would you want the money from someone who is possibly scamming the government? Everyone know about Tesla and the advance they are making in the auto industry but recently Forbes wrote an article about how Tesla can hack the tax code to max out the number of people who can $7,500 back from the people who put deposits on Tesla’s new car. 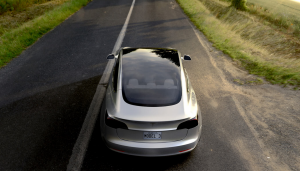 Tesla is releasing a new car, the Model 3, in late 2017. Elon Musk, who created Tesla, suggests that Tesla might be able to manipulate its deliveries to allow the largest possible number of the new Model 3 owners to get a benefit. The government gave auto makers an incentive to produce electric cars by offering $7,500 back to the first 200,000 buyers. The Internal Revenue Code lays out the information by saying, “The qualified plug-in electric drive motor vehicle credit phases out for a manufacturer’s vehicles over the one-year period beginning with the second calendar quarter after the calendar quarter in which at least 200,000 qualifying vehicles manufactured by that manufacturer have been sold for use in the United States (determined on a cumulative basis for sales after December 31, 2009) (“phase-out period”). Qualifying vehicles manufactured by that manufacturer are eligible for 50 percent of the credit if acquired in the first two quarters of the phase-out period and 25 percent of the credit if acquired in the third or fourth quarter of the phase-out period. Vehicles manufactured by that manufacturer are not eligible for a credit if acquired after the phase-out period. (emphasis added).” This means that let’s say Tesla selling 200,000 cars in February the calendar quarter ends in March you can take a lot of buyers in the next quarter then you have to start phasing out credits to your buyers. If you order a Model 3 in July- December, you get half of the $7,500 and January-June of the next year you will receive a quarter of the $7,500. If the release of the Model 3 is delayed, then Tesla would hit the 200,000 vehicle in the beginning of 2018 and no will be able to get the full $7,500 because the deliveries will be towards the end of that year. But if Tesla can get the Model 3 out on time in late 2017, the incentive is still there and the consumers will receive the benefit. Tesla needs good timing for this to work and have 200,000 Model 3’s sold between January- April and then Tesla has to to produce the cars extremely fast. However, if Tesla makes more money faster, hits 200,000 as soon as January 2018, consumers would receive a tax break of $3,750 instead of the $7,500 that Tesla is trying to get them. Do you think Tesla is being ethical by trying to get their consumers a benefit from the government based on their release and deliveries of their new Model 3 car? I think this is not a good thing for tesla to be doing but as consumers they are doing nothing wrong.